Life would be harrowing if we had no ability to feel pain. Although experiencing it is unpleasant, pain's purpose is to alert us to something wrong in our body. Without pain diseases and other problems could worsen to the point of life-threatening. But pain without a purpose — the nerves simply misfiring — can make life miserable. This can happen with the trigeminal nerves that exit the brain stem and end on each side of the face. 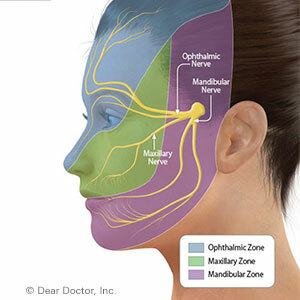 Each nerve has three branches that serve the upper, middle and lower parts of the face and jaw. When they don't work properly, trigeminal nerves can give rise to a disorder known as trigeminal neuralgia. Beginning often as an occasional twinge, they may escalate to several seconds of mild to excruciating pain occurring over weeks, months or even years. An episode may erupt from chewing, speaking or even lightly touching of the face. We see this condition most often in people over fifty, particularly women. We don't know the exact cause, but there's strong suspicion that the nerve's protective sheath has been damaged, similar to what occurs with multiple sclerosis or other inflammatory conditions. Another possibility is a blood vessel putting pressure on the nerve and disrupting its normal operation. Such an impinged nerve might transmit pain signals at the slightest stimulation and then fail to “switch off” when the stimulation stops. Although we can't cure trigeminal neuralgia, we can help you manage it and reduce discomfort during episodes. We'll first try conservative, less-invasive techniques, like signal-blocking medications or drugs that reduce abnormal firing. If these aren't effective, we may then recommend a surgical solution. One such procedure is known as percutaneous treatment in which we insert a thin needle to selectively damage nerve fibers to prevent their firing. If we've determined an artery or vein has compressed the nerve, we might surgically relocate the vessel. These techniques can be quite effective but they do have possible side effects like numbness or hearing loss. If you've experienced facial pain, don't continue to suffer. Visit us for a complete examination and learn about your options for pain relief. More than likely, there's a way to reduce your pain and improve your quality of life.